SG-1 races against Baal in the hunt to find the Sangraal, Merlin's anti-Ori weapon, and comes up against a series of ancient trials. Cameron Mitchell and Teal’c stop by Daniel Jackson’s lab to see if he wants to go eat with them. Daniel’s research reveals that the coordinates of the planets that King Arthur visited looking for the Sangraal — Merlin’s weapon believed to be capable of killing ascended beings, such as the Ori — form an equilateral triangle. When the coordinates of the Camelot planet are added, they form a perfect pyramid in space. Jackson is unsure of its meaning, however. Waking suddenly, Vala Mal Doran races to Jackson’s lab. Her dream suggests that Merlin’s weapon is on a planet whose address is made up of symbols taken from the addresses of the three planets — Castiana, Sahal, and Vagonbrei. They take their new-found understanding to Samantha Carter, who initiates a scan of the S.G.C. database of Stargate addresses. Almost immediately, one address only is located. SG-1 gates to the planet. Encountering a village similar to Camelot, they ask for information. The villagers tell them that they are the second group taking up the quest for the Sangraal. The other, from their description, was Baal and his Jaffa. A villager points them to the library. Osric, keeper of the archives, says the Sangraal is in a cave beyond the outlying forest, an area enchanted by a terrible curse set by Morgan Le Fay. She left the Parchment of Virtues as a guide for those virtuous knights of noble spirit who demonstrate prudence, charity, kindness, wisdom, and faith. The Sangraal belongs to “he who speaks the guardian’s name.” That guardian is a fearsome dragon. Even though they discount the notion of curses and dragons, Osric shows SG-1 the Parchment and tells them about a map. But he refuses to share the map because Baal attempted to steal it. Discussing their options at the inn, a commotion outside draws their attention. Ori soldiers have arrived, and round up several villagers. Disguised by cloaks, SG-1 watches as the contents of the library are burned. A Prior of the Ori lectures on the path to enlightenment. SG-1 retreats to the inn. The innkeeper asks how the Ori can be defeated. Carter tells her the one thing that can save them is the Sangraal. Osric seeks refuge at the inn. The map has been burned with the rest of the library, but he knows the location of Merlin’s treasure, and he offers to guide SG-1. When soldiers come, the innkeeper shoots one with an arrow and SG-1 kills the rest before escaping through a secret door. Osric leads them to the woods, where they find several villagers frozen in place. Carter recognizes it as a time distortion field; the people are trapped there, moving so slowly that they seem to be standing still. Locating a maze-like path of real time through the field, Carter guides them until temporal distortions inhibit her sensor device. Using low-tech rocks, she manages to lead them through to the end. Journeying on, Jackson and Osric discuss the Ori and the supernatural. His words rouse suspicion in Jackson. Before Daniel can question him further, Teal’c alerts them to the presence of Baal. The team rushes into the clearing where the fallen Goa’uld System Lord is casually sitting on a treasure chest, and are trapped with him inside a force field. Another of Morgan Le Fay’s obstacles. While Vala and Jackson examine the chest, Mitchell and Carter play keep-away with an energy bar the hungry Baal wants. Though he’s had the S.G.C.’s database for months (“Insiders”), he couldn’t reach the planet by ship. Accessing it by Stargate, he has been searching for Merlin’s device and has been trapped within the forcefield for three days. Morgan Le Fay’s safeguards have also cloaked the planet so the Sangraal could not be destroyed from orbit. They came through the time distortion field using prudence — one of the five things legend says those who seek the Sangraal will need — so the empty chest is logically the part of the quest related to charity. Once everyone places something of their own inside the chest, the field dissolves. Baal is permitted to tag along because he claims to know the name of the dragon, the only way of defeating it. Pausing at the entrance to the caves where Osric believes the Sangraal is hidden, SG-1 confronts him. Daniel was tipped off by Osric’s words — a paraphrase from the Book of Origin — and the Ori designs on his ring. “Osric” drops his act and his holographic personae, revealing that he is, in fact, Adria — leader of the Ori invasion force. Adria influenced Vala’s dream to lead SG-1 to this planet. Morgan’s safeguards require someone with truth of spirit retrieve the Sangraal. Adria knows that it is the only thing that can stop the Ori, and that she can’t obtain it on her own. Once Jackson procures Merlin’s weapon, she will take it, and thus, defeat all opposition to the Ori. She threatens to kill SG-1 one by one if Daniel and the others do not cooperate. For now, SG-1 must work with two of their greatest enemies. Inside the cave, they encounter a plaque on the wall: “Choose the way that is just and true.” Teal’c and Carter hear a child’s cry. Mitchell runs after the child who becomes trapped behind a heavy gate. When they all attempt to lift the gate, it and the child disappear, revealing, by their kindness, the way forward. They quickly find a second plaque on the cave wall ahead. “I am struck and cut, shaped and cooled, then bound by rings to release what’s stored.” The ceiling starts to crumble. The solution, Mitchell says, is a key. Jackson shouts it in Ancient and the path is cleared. The ceiling continues to dissolve as they reach another plaque. “I shake the earth with booming thunder, fell forest whole and homes complete. I influence ships, topple kings, sweep down swift, yet remain unseen.” The wind, Teal’c offers. Again, Jackson translates and the path and next plaque are revealed. “Battle-scarred in times of strife, resistant to …” Jackson can’t read the rest. Adria answers “contasia.” Their wisdom stops the ceiling from falling. Feeling warm, the group next finds a curtain of pure fire. After they stand there stumped for some time, Jackson realizes it is the test of faith — the only one of the five virtues they haven’t yet used on their quest. He steps through the flames, causing it to disappear. The path leads to a room with a narrow stone bridge over a bottomless void. On the other side is a pedestal with a small, glowing orb — the Sangraal. Adria decrees that only she and Jackson will cross. Jackson has realized that, because of the Ancient defenses put in place by Morgan Le Fay, Adria’s Ori-given powers do not work here. When they reach the other side he refuses to help her. He tries to grab the Sangraal, but it is a hologram. The way back seals itself, trapping them as a massive dragon swoops in, flames bursting from its mouth! “I love episodes in which unlikely alliances are formed — and none more unlikelier than the ones in ‘The Quest, [Part 1],’ in which SG-1 must team up with two of their greatest enemies — Baal and Adria — in their quest for the Sangraal. Overall, I liked this episode a lot but there were a few little things that really, really bugged me. The first was in the scene in which the Ori soldiers descend on the town while SG-1 is hiding in the tavern. In one unscripted beat, an unarmed villager (apparently suicidal unarmed villager) charges toward an Ori soldier and gets blasted. Bad enough, but the blast catches him in the shoulder, initiating a ridiculous backward flip before hitting the dirt. “Another bump I had with the episode was the time distortion field. I loved the idea — so much, that I didn’t heed my writing partner Paul’s warning that it would be difficult, if not impossible to pull off. I dismissed his concerns and figured we could cut around any movement on the part of the frozen travelers — which proved easier said than done. A blink here, a waver there, and I found myself pulling my hair out in the editing suite. “The final issue I had with the episode was the dragon. Overall, pretty cool but what was with those gimpy legs? “At one point in this story there are seven of us walking through the forest in search of our ‘Holy Grail’ as it were. 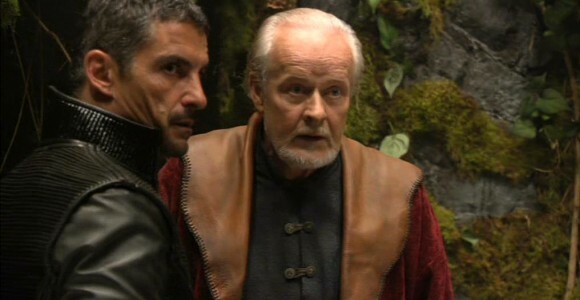 It’s the five SG-1 members, another character who winds up becoming one of the bad guys, and Cliff Simon [Baal]. We were waiting for General Landry [Beau Bridges] to show up and join the group, or Gary Jones’ character of Walter Harriman. Why not have everyone wandering around and talking at different times! VOTE! How would you rate SG-1's "The Quest, Part 1?"